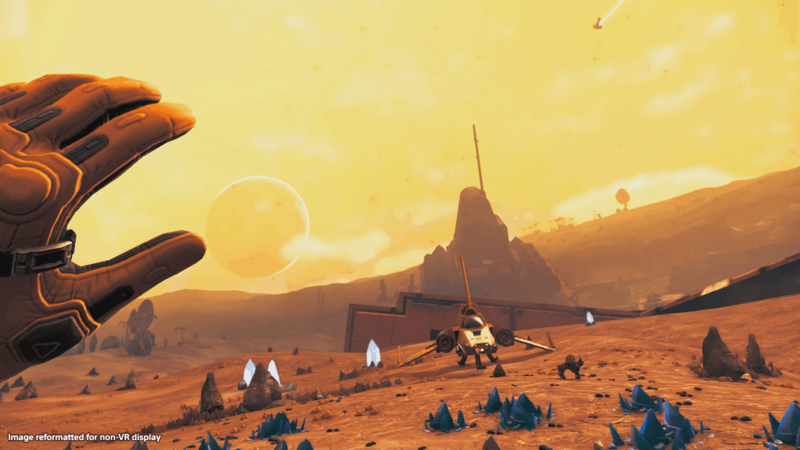 It’s no secret that No Man’s Sky had a rocky start when it originally launched back in 2016. The game was full of bugs and altogether not what many gamers expected. Fast forward to 2019, and No Man’s Sky is well on its way to becoming the game it was originally promised to be. Almost three years later, the development team is taking arguably their most ambitious leap yet, moving the game into VR. But does the port work? And perhaps, more importantly, is there a reason to check out the game if you originally felt burned by it? The answer to both is a resounding yes. Over the course of the 15+ minute demo, I was thrown into the world of No Man’s Sky VR, and the first thing that struck me was how vast the world really is. That may seem rather obvious, given that No Man’s Sky was originally pitched as a near limitless universe explorer. However, actually being in the dirt-covered terrain and being able to explore the nearest horizon in VR is an experience that significantly elevates the core gameplay. No Man’s Sky VR – Photo Courtesy of PlayStation Canada. In the demo, the first thing that I did was dig a hole and stand in a cave. Now, that may not seem very interesting, but thanks to VR, it made me feel like I was genuinely exploring an alien planet. The caves give the world a real sense of scale, and it made me want to explore every nook and crevice that I could find. When No Man’s Sky originally launched, there was no real sense of satisfaction for exploring, but in the VR version, the very act of exploring is the payoff. I was on a mostly barren, dust-covered planet and still felt the urge to explore. I can only imagine how engaging a more lush planet would be to poke around in. The other standout moments from the demo involved piloting the land-based rover and the world-hopping starship. Both feature detailed cockpits, and when you get in you have to physically close the door that you entered in, which is a nice touch. The rover uses a steering wheel and thruster and feels faster than the starship. The starship features a thruster and joystick control scheme, along with a number of screens that give you information ranging from the temperature of the planet to your name and bearings. Both feel satisfying to control although the rover is a bit more of a bumpy ride. 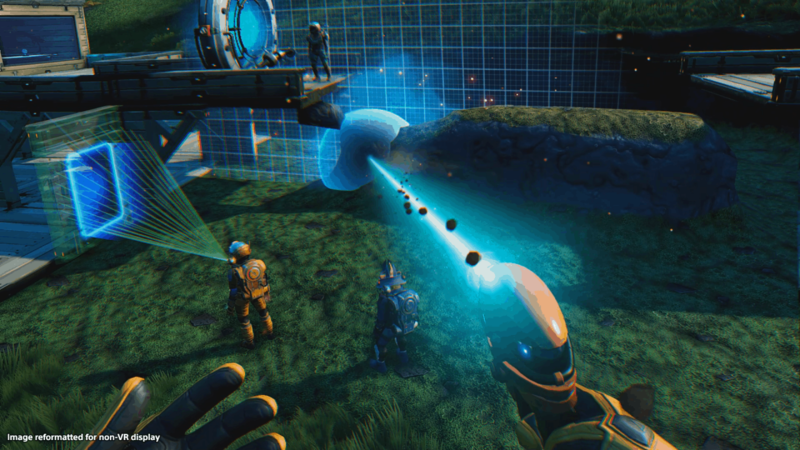 The default movement in No Man’s Sky VR is teleportation, which many games use to get over the potential VR nausea issue. You end up aiming with the PSVR controller and I was surprised at how accurate the point and click mechanic was. There will still be the option in the final game for regular, non-teleportation travel if that’s something that you prefer. Speaking of controls, the game uses wrist gestures for most of its menus and abilities and they help make the game feel immersive. I did, however, run into a bug that didn’t let me use my flashlight while checking out the menu, but that is something that the dev team says will be fixed for the final game. Still, that was the only bug that I experienced and it’s quite impressive how far the game as a whole has come since launch. 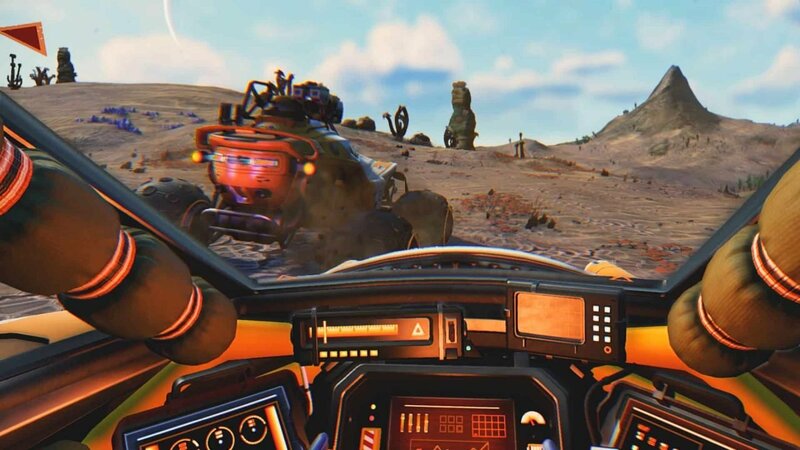 Following the demo, I was able to talk to Hello Games’ Jennifer Clixby about the more technical side of the No Man’s Sky VR, the importance of hand gestures, and why you should check out the update when it launches. CGMagazine: When did you start working at Hello Games? Jennifer Clixby: I’m actually the new person here, and I started four months ago. I arrived just before November and had a hectic couple of weeks getting up to speed on everything. I basically help out on the production side, and there is a game that we announced last year called The Last Campfire. So I have a couple of different things to work on. CGMagazine: What was the hardest part about bringing No Man’s Sky to VR? Jennifer Clixby: The main hurdle was figuring out how do we take a game that you control with a DualShock and bringing it into VR. With VR, there are different factors that you have to take in design wise. In general, there are all these rules about making games that largely stay the same no matter what you’re making. The thing is that when you’re making a VR game, a lot of those rules just go out the window. Until you actually try it in VR, you don’t really know if it’s going to work. CGMagazine: How does working in VR compare to developing a regular game? Jennifer Clixby: It’s not necessarily harder, but the major aspect that we had to nail down was figuring out how everyone moves their hands. Gestures can be quite different from person to person, and the menus in our game come up via your wrists. So the person who’s developing those menus, they look at their wrists and they’re like, “It works perfectly!” Then someone else will try it and, if they rotate their wrist differently, then they might get a different outcome. The ship controls, in particular, are something where I move my hand differently. I rotate my wrists when using it, and the guy who actually implemented the controls moves his arm more. So we have to make the game work for however, the users prefer to use it. The wrist issue has been fixed, but when I was using it we realized that we weren’t taking the rotation into account as well as the position. So there are all these different things that differ from person to person, and the more people play it, the more we can get a control method that works for as many people as possible. 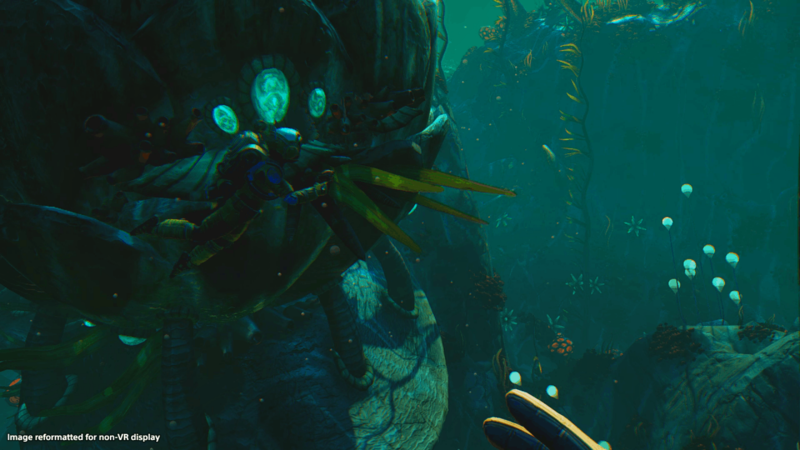 CGMagazine: How does development between the VR and non VR projects work? Jennifer Clixby: They’re not really different. Since it’s all parts of the same game, we look at the VR port as a new feature set and we have basically the whole team working on it. That being said, we do have people who are dedicated to getting the controls working in VR, but they also look after other systems in the game, so there’s a bit of everything. 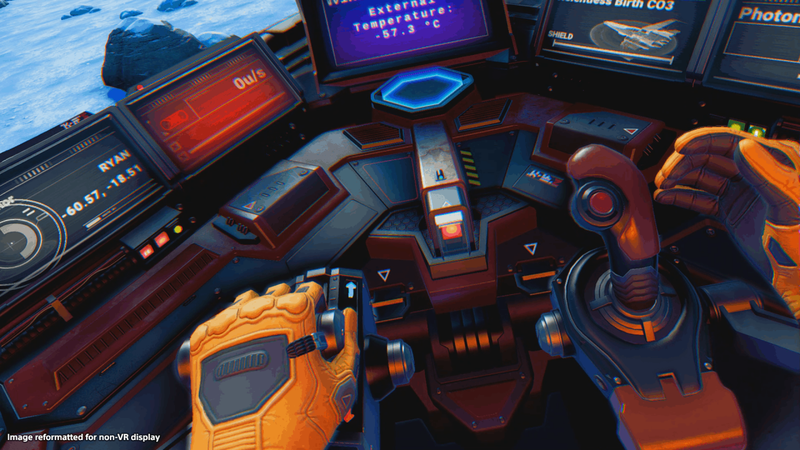 CGMagazine: What does VR bring to the No Man’s Sky Experience? Jennifer Clixby: If you have played No Man’s Sky, then definitely download the update when it comes out. And if you have a VR headset, I think it really magnifies the awesome experience. Even something as simple as drilling into the terrain, making your own little cave and standing in it is memorable. It’s somehow so compelling and relaxing. We didn’t show anyone sitting in a cave during the trailer because it’s not all that visually compelling, but when you’re actually in it and interacting with the world, the feeling is indescribable. 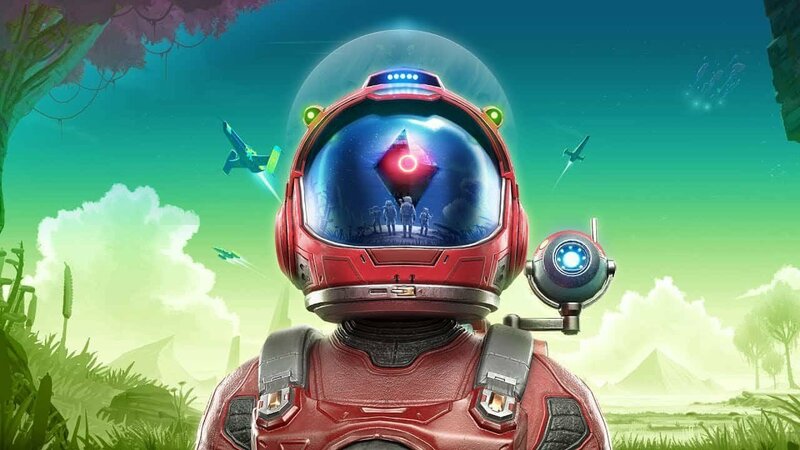 CGMagazine: What message do you have for those curious about No Man’s Sky VR? Jennifer Clixby: There’s so much more in the game that we haven’t shown, and the team has been working hard for two years developing so much on it. If you’re someone who hasn’t tried No Man’s Sky, now is the time to do so. There’s just so much to the game and it’s really come a long way. It’s incredible what’s gone into the game and all the effort the team has done. We think it will definitely pay off. No Man’s Sky VR launches this summer. Stay tuned to CGMagazine for more updates on the game moving forward.